Algamar was established in 1996 by two brothers, Clemente and Fermín Fernández Sáa, with the aim of promoting and spreading the wonderful nutritional properties of the native marine algae from Galicia. The seaweed or sea vegetables harvested by ALGAMAR in Galicia are wild vegetables. As the official publications of the Fisheries Authority state, seaweed is an abundant, native and natural resource that moreover renews itself every year in the sea and is therefore a stable and sustainable foodstuff. 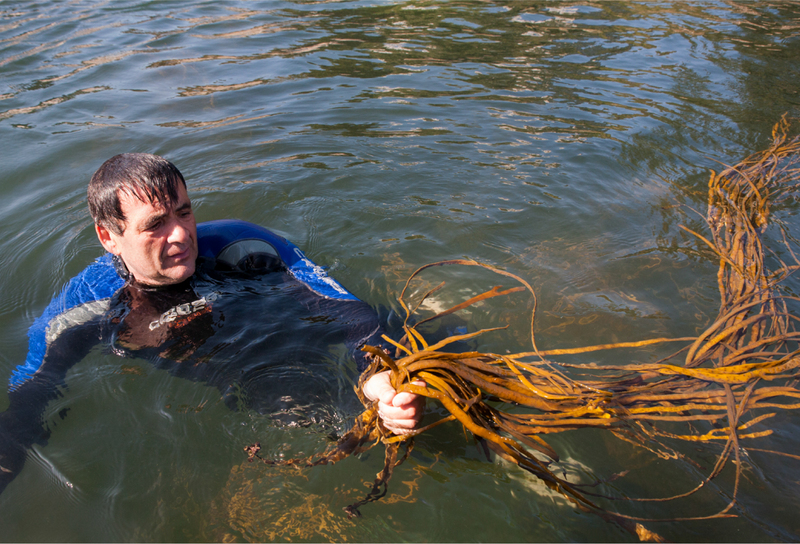 Sea vegetable harvesting is regulated and supervised by the Xunta de Galicia (the Regional Autonomous Government) by which ALGAMAR has been licensed on a yearly basis since it was established (published in the DOGA – the Official Bulletin of Galicia). Our company is located in a rural community –Pazos de Borbén– considered by the European Union to be “an area at risk of depopulation”. The work provided by ALGAMAR helps the local population stay in their place of origin, thus keeping alive their social and cultural wealth. The company is registered with the Official Control Authority (CRAE) as an Organic Producer. 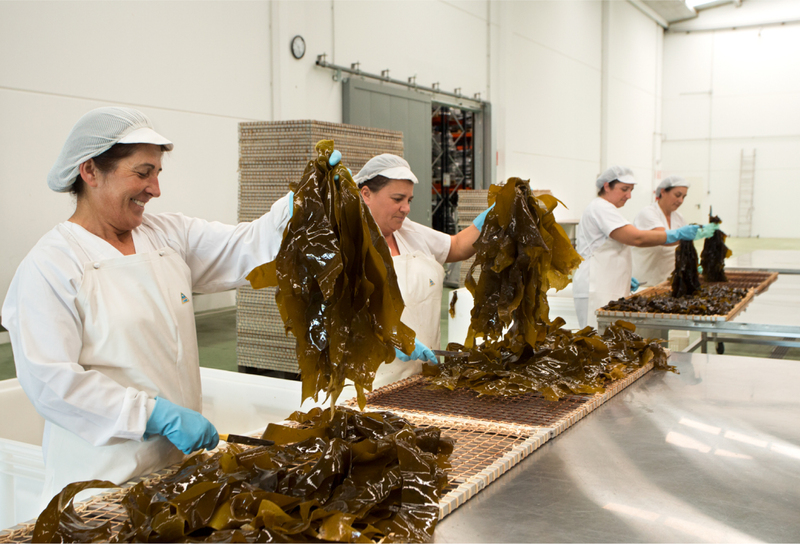 In 2008 the Department of Nutrition and Food Technology of the University of Santiago de Compostela concluded and certified that Algamar’s sea vegetables “have the characteristics expected of a healthy foodstuff”. In 2009, the Spanish Ministry of the Environment awarded the BIODIVERSITY 2009 PRIZE,to Algamar for its example of innovation and solidity in the management of and respect for natural resources. In a first for the organic sector, in 2010 Algamar’s sea vegetables received the European ORGANIC CERTIFICATION under the new European Commission Regulation No. 710/2009 that came into force on 1 July 2010. 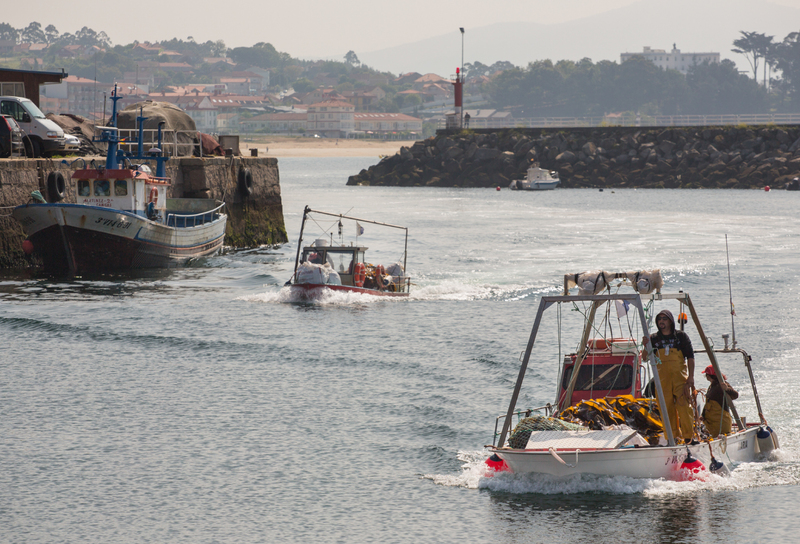 Since its beginnings Algamar has cooperated with the local fishermen’s associations, offering an innovative alternative to conventional fishing. In 2013, Algamar took one step further in its commitment with ecology. High efficiency photovoltaic solar panels were placed on the rooftops of the plant, so all the electricity used in the process is self-produced in a clean and sustainable way. In 2014 ALGAMAR expanded by building its second factory, further developing the company policy to energy sovereignty and use of renewable local resources. New seaweed dehydrators, working with a biomass boiler system and fed with local woodland debris were installed in this plant. ALGAMAR publications: all our books, posters, catalogues and leaflets are printed on certified FSC ecological paper made with trees from responsibly managed forests. Algamar is a pioneer in the harvesting, processing and direct production of sea vegetables and has the legal recognition of the Autonomous Regional Government and its Department of Fishing, Shellfishing and Aquiculture. Low temperature (< 42 °C) drying preserves the maximum nutritional value. The company’s modern, stainless steel facilities, which it designed itself, can dry up to 10 tons of freshly-harvested algae a day. 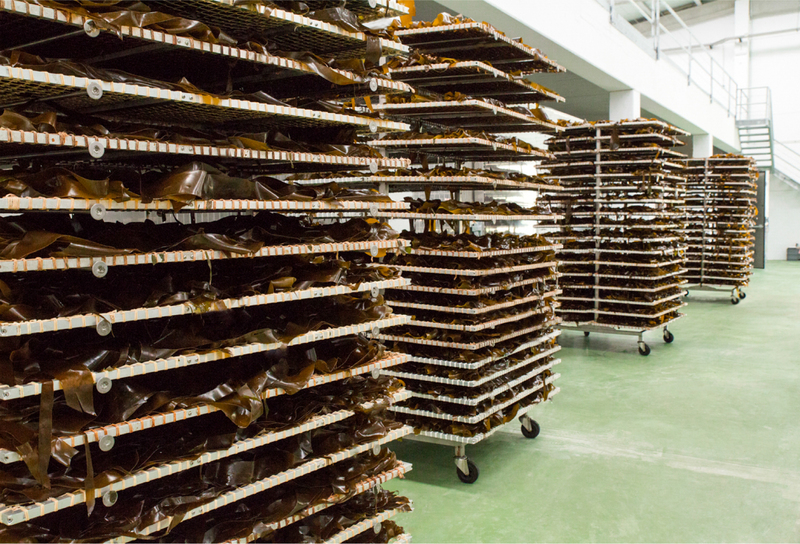 This makes some 1000 kilos of dehydrated sea vegetables, ready to be packaged in sheets or to be ground for use as an ingredient in one of the products made with algae. 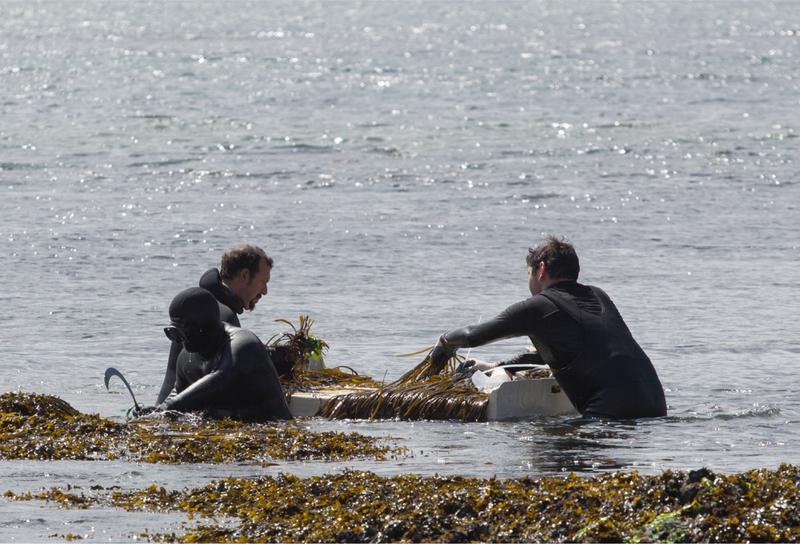 This is one of our fundamental activities, bearing in mind the lack of knowledge among consumers about sea vegetables. When Algamar was founded, its work was without precedent in Spain. The company carried out a study of all the native species with the direct assessment of experts in nutrition, both from Spain and other European countries, as well as with the valuable support of the universities. Once this data had been collated and satisfactory analytical and scientific results had been achieved, our sea vegetables were ready to be presented to the public. We began therefore on the task of placing Galician Sea Vegetables and information about them in the public eye, to allow the consumer to make his or her own evaluation of them. Since 1998 Algamar has cooperated with the Consejo Superior de Investigaciones Científicas in Spain (Department of Metabolism and Nutrition) and with the Universities of Santiago de Compostela (Food Sciences) and Complutense de Madrid (Pharmacy) in undertaking various studies relating to the potential of native edible algae. At the invitation of the University of Santiago de Compostela the company took part in the “As Algas na nosa Vida” (Algae in Our Life) Exhibition during Spring 2002 at the University Museum of Compostela. Since 1997Algamar has been present at all the most important organic food fairs in Spain as the first exhibitors of algae in the history of the Spanish organic food sector, organising at the same time talks, workshops and tastings. 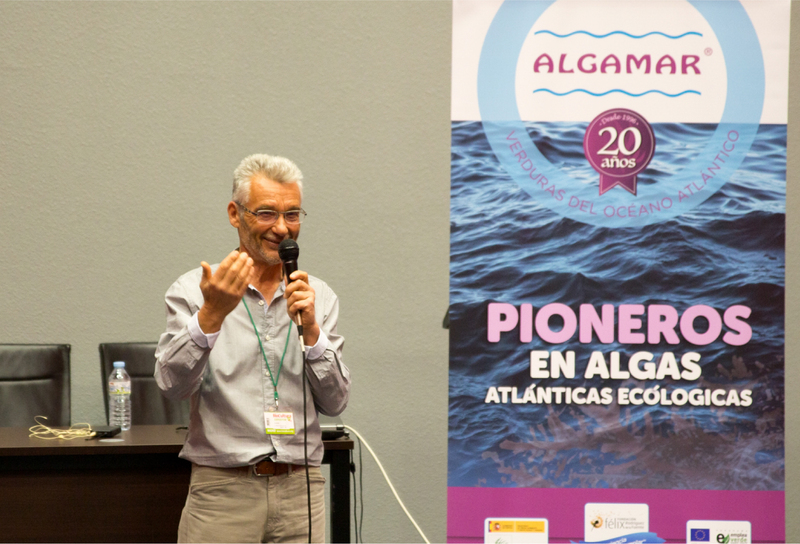 Since 1999 and for the last 5 consecutive years Algamar has organised the weeklong “Atlantic Algae Conference” in Galicia, with scientific presentations (about the biology of our algae, their habitat and nutrition), practical classes on the sea and cooking, and a daily menu made with sea vegetables. Participants and speakers come from Spain, France, Germany, Switzerland and Mexico and the conference is organised with the cooperation of the University of La Coruña. In August 2003 the 5th Conference was held on the Island of Arosa in facilities belonging to the Gallegan Institute of Aquiculture Training of the Autonomous Government of Galicia. In 2002 Algamar published the book, “Seaweed from Galicia. Food and health: properties, recipes and description.” with 272 pages of information on the nutritional value of seaweed. A second book, “Recipes with Atlantic seaweed” was published in 2004, and was prized at the Gourmand World Cookbook Awards to the best vegetarian cooking food in Spanish.